For today’s troops in the field, Army life is all about being hitech. From night vision goggles to keeping contact with command via radio, to even GPS navigation equipment, video cameras sending live feeds and even a portable PDA that soldiers use in the field, today’s soldier uses a ton of gadgetry in the field that is eating up power in day to day operation. Batteries are heavy and with that kind of gadgetry, you’d need to carry a lot of them, or rely on equipment for recharging that would not necessarily have access to an electrical source. To that end, the Australian government is investing millions to develop an ultra light solar panel that soldiers can use to charge their tech. Now, granted, solar is nothing new. Commercial options such as the Solio and even backpacks with built in panels are available. But they are subject to the good weather that allows the panels to gobble up the light energy and transfer it to electrical energy. And the battlefield isn’t always a sunny day. So, the a 14 ounce solar panel will need to be effective on cloudy days by solar radiation in addition to solar light energy. 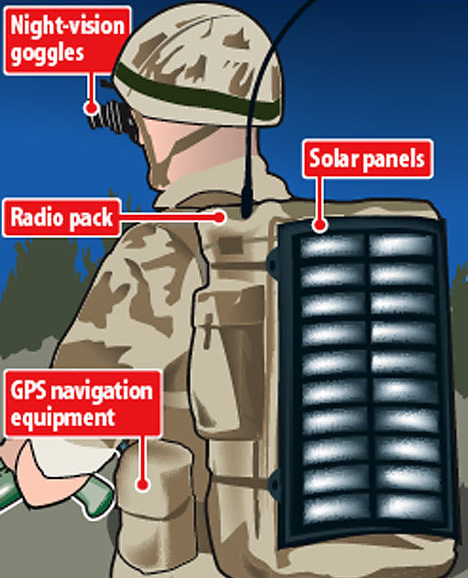 Like their commercial cousins, the ultra light solar panels will be built into their backpacks and connect directly to the wide range of electronic equipment now used in combat. Now instead of being nearly invisible from the sky, infantryman trying to keep their heads down will now look like shiny dots from reconnaissance planes, fighter bombers, and helicopter gunships.